The publicity around the UNSG contest this year is unprecedented. When I launched UNSG.org in 2006 to cover the race that year, the site was the only authoritative source of information on the race, including copies of the nomination letters and leaked results of straw poll votes in the Council. Today, the 1 for 7 Billion coalition maintains a robust site with similar details, and the United Nations itself has an official page with candidate bios and details. It is far different world from 2006. So where does everything stand this year? There are currently seven official candidates seeking the post of UN Secretary General. The contest officially opened on December 15, with the release of a joint letter from the President of the UN General Assembly (PGA), Mr. Mogens Lykketoft, and then-President of the Security Council, U.S. Ambassador Samantha Power. The slate reflects a strong consensus for the next UN Secretary General to be an East European national, the only regional group yet to hold the post. Six of the seven nominations that have been received are from that regional groups. (The exception being António Guterres of Portugal.) However, governments have largely failed to respond to the strong call from civil society groups to choose a woman as the next Secretary General. Three female nominees are competing against four men for the post. Informal dialogues between candidates and other member states before the Council finalizes its nomination. The December joint letter echoed all of these, strongly pushing the process forward. Within a month, three candidates were officially nomination – Kerim, Pusić, and Lukšić. 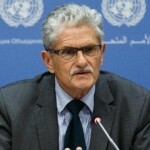 In February, President Lykketoft briefed the press on where the process stood since the joint letter’s release in December. All member states had received copies of then six official candidates’ letters of nomination and curricula vitae. Each candidate will be allotted a 2-hour window to engage with member states, present their candidatures and answer questions from members states. The meetings will be open and webcast on the UNPGA’s website. Media and other civil society groups will be able to engage candidates after the meeting at a media stakeout to follow. The PGA urged all governments who planned to offer a nominee do so soon so they could participate in the informal dialogue with members in April. However, he noted that there was no deadline set for nominations and that another round of meetings might have to be scheduled before the Council was expected to begin its considerations in late July. The process at this phase is remarkably open and similar to that carried out by the Food and Agricultural Organization in the selection of its Director General, including the use of an official circulated letter opening the race and publicly accessible interviews between member states and candidates. The Council, which has yet to announced its process or timeline for vetting the candidates, is likely to be less transparent. What impact might these dialogues have on the Council’s consideration? Might the Council to put forward a nominee that has not participated in the informal dialogues with the Assembly or is not the apparent favorite of a majority of member states? Numerous governments and civil society groups are proposing the next UN Secretary General expect to serve a single 7-year term, a proposal initially put forward by Canada in 2006. Prior to the April discussions,the Assembly will be holding a debate on the selection on 22 March. During this time, it is expected that members will elaborate on the Assembly’s role in the selection process and may call on the Council and fellow governments to implement other reforms. 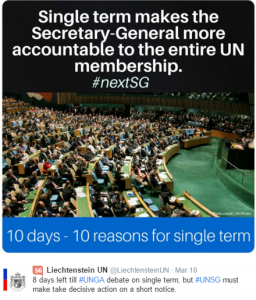 One receiving much attention this month (especially on Twitter) has been for the next Secretary General to serve a single extended term, with 7 years being the most commonly suggested length. Neither the Charter nor subsequent resolutions ever defined the length of term, but most Secreataries-Generals have served a once-renewable 5-year term. Another reform which members may urge this month will be for the Council to present two nominees for the Assembly’s consideration. This will be unprecedented and will dramatically increase the Assembly’s role in the selection. The Council has never nominated more than one candidate, and the Assembly has never failed to appoint him by acclamation. The Assembly may reject the Council’s nomination, should it call for multiple candidates and the Council not respond or should the Council put forward a single nominee whom the Assembly finds objectionable. In commenting on this, the PGA affirmed that it was the perogative of the Council to offer one or multiple nominees, but believes that the Assembly would not reject a single nominee, being aware of the appropriateness for the Assembly to provide the incoming Secretary General the strongest support. We’ll learn more on 22 March when the Assembly discusses further its expectations and preferences as the process continues to unfold. Follow Global Memo on Facebook or Twitter for more regular updates.